Aunt Carol's Place @ The Beach is a well established nursing home for the elderly in Pismo Beach, CA, that has been in operation since 2007. We are an excellent choice for senior assisted living, as well as a dementia and Alzheimer's care facility. We are now living longer than we used to, but often in a condition which requires some assistance. Finding a residential elderly care facility that is appropriate to your needs can be difficult and our assisted living facility is here to help guide you through the many choices. We are familiar with such services and have a personal awareness of the various facilities available to seniors when living at home is no longer a choice. We are so concerned with fall prevention, safety always comes first and you will always be in safe hands with our staff. Our care adviser provides our clients with the best in care while letting them feel safe, secure and comfortable at Aunt Carol's Place @ The Beach in Pismo Beach, CA. 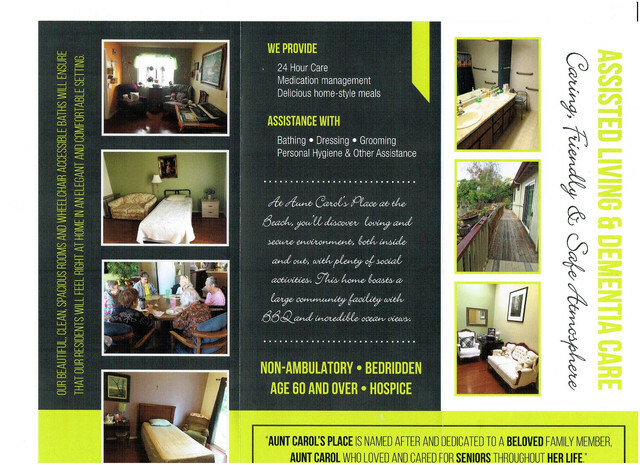 AUNT CAROL'S PLACE @ THE BEACH is a Residential Care Facility for Elderly with Dementia and Alzheimer's Disease, age 60 over, A Non Ambulatory, Bedridden with Hospice Care. We provide 24/7 in home care, Medication management and a delicious home style meals. We assist with bathing, getting dressed, grooming, and personal hygiene one on one daily with each resident. We also have a very loving in house Doctor. Our Mission is to treat the client with dignity and respect .. we take good care of them til the end of their life.. All they need is Love.. and that's why AUNT CAROL'S PLACE @ THE BEACH IS her for everyone. Aunt Carol's Place @ The Beach © All Rights Reserved.